Up until now, David M. Schwartz and Steven Kellogg had cornered the market on really big numbers with their classic How Much Is a Million? Their examples make the concept as clear as it’s going to get for human brains. (Did you know that four is the highest number of objects humans can count at a glance?) Now Kate Hosford tackles an even bigger number, or rather concept: infinity. She uses examples, too, but they tend to be more philosophical than Schwartz’s, along the lines of Albert Einstein’s thought experiments or plain old metaphors. Concept books tend to get slapped with the "quiet" label almost automatically, and this book certainly isn't loud. I can't picture a rowdy first grader of either gender sitting still for it. But a more thoughtful child in the 7 to 9 age range, yes. Picture this: A girl named Uma is wearing her new red shoes and looking up at the stars. “How many stars were in the sky? A million? A billion? Maybe the number was as big as infinity.” Feeling very small in the face of infinity, Uma starts asking her friends and relations how they picture that endless idea. Her friend Charlie says, “It’s a giant number that keeps growing bigger and bigger forever.” Her friend Samantha thinks of the infinity symbol as a racetrack she could drive around and around forever. Her grandma thinks about a family with an endless procession of descendants. Uma asks more people what they think, but she also begins to play with the idea for herself. It's starting to make her head hurt, yet it fascinates her, as well. Infinity and Me goes on with its barely-there narrative. Although, come to think of it, this is a quest tale—a quest for knowledge. The red shoes provide a minor secondary motif. The book ends on a note of love and a return to looking at the stars. Kate Hosford's approaches to infinity are poetic and thought-provoking. Her small narrative makes a humanizing frame for a concept as cold and vast as outer space, whose stars are what get Uma thinking in the first place. Illustrator Gabi Swiatkowska has an unusual style. The textures, floral patterns, and clothing make me think of Europe in the 1940s—and I just looked at the back jacket flap to confirm that the illustrator is from France. That doesn’t mean anything necessarily, but perhaps you’ll see my point when you look at the book. In addition, while Uma and her friends and grandmother are fairly dimensional, other parts of the book have a flat, decorative look. So we get a combination of three-dimensional and two-dimensional effects, an essentially black-and-white palette touched with splashes of color, and odd decorative elements such as a few flowers, a bee, two lollipop-top looking designs, and several hanging loops like jungle vines on the infinity racetrack spread. The infinity symbol “track” itself is checkered black-and-white like a finish flag for racecars. Uma rides her green bike around the track, while her friend Samantha drives a green car. There’s also a white chicken running along behind Samantha’s car. (The chicken pops up often in the pages of the book.) Plus there are a few splashes of greenish turquoise and a little yellow. When you stop to think about it, the effect is surreal. Then again, so is the idea of infinity. I should mention the endpapers. They are covered with multi-digit hand-inked numbers that do not count up in order. We get an author’s note with some great information, as well. Did you know that the infinity symbol is called a lemniscate? So. This is a strange book. It’s also a beautiful one, and an apt one, dealing with something so difficult as to be thoroughly unimaginable. Which means Infinity and Me is an ambitious book, too. 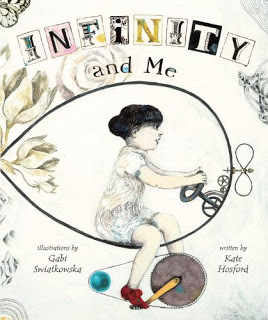 Considering what infinity is (or is not) and that this is a picture book, not a math tome, I would argue that it achieves its goals—with style. See the really great guest post by Kate Hosford about writing the book at Cynthia Leitich Smith’s Cynsations. I am madly in love with children's books and want to get great books into the hands of kids who will love them, too. Books are like magnifying glasses, intensifying the wonders of people and their imaginations and everything in the world from spiders to shoelaces. Books are a unique sort of conversation. I write them, too, mostly MG fantasy, but sometimes poetry and picture books. Thank you, Johanes Gutenberg! What Is It with British Writers and Fantasy?